De Los Santos Medical Center recently signed a Memorandum of Agreement with Maxicare Healthcare Corporation to strengthen its existing parntership with the said health maintenance organization (HMO). Under the memorandum, Maxicare will remain as one of the hospital’s HMO partners for three more years. De los Santos Med is a subsidiary of the MVP Group of Companies under the umbrella of Metro Pacific Hospital Holdings, Inc., the hospital investment arm of Manuel V. Pangilinan’s Metro Pacific Investment Corporation (MPIC). The instution has partnerships with over 20 HMOs based in Metro Manila. 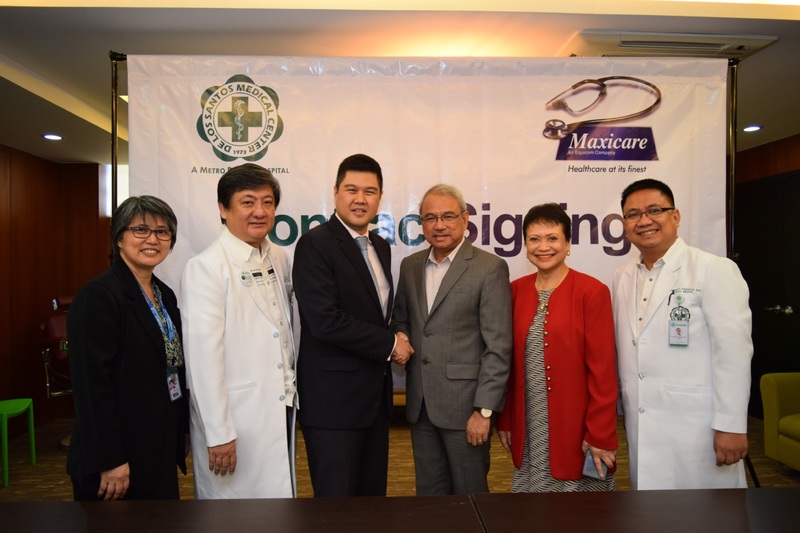 In photo during the contract signing (from left): Liza Juanita Expiritu, MD, Senior Manager, Providers Relations of Maxicare; Nilo De Los Santos, MD, Vice President of Medical Affairs and Chief Medical Officer of De Los Santos Med; Christian Argos, President and CEO of Maxicare; Raul Pagdanganan, President and CEO of De Los Santos Med; Erlinda Tiuseco MD, Medical Vice President and Medical Director of Maxicare; Lysander Ragodon, MD, Vice President for Business Development and Planning of De Los Santos Med.